Basil, I love basil! The scanned image shown here is from the 2004 Burpee seed package. 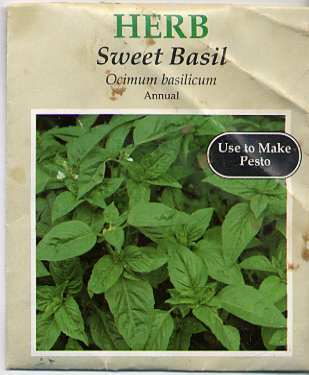 In my opinion, everyone that can should grow basil at least once in his or her life. Of course, if I write about all of my favorite herbs, I will say the same, Everyone should grow it. Basil is easy to grow. The plants need full sun, and they can be grown from seed or plants. The seeds are tiny, so it is best to sow them in a flat and then set the seedlings in the garden 12 inches apart. I read the back of my Burpee seed package and they recommend sowing the seeds in the ground and then thinning the seedlings to stand 12 inches apart. After that, Burpee wrote, Pinch to promote bushy growth. That is not unusual, but then Burpee wrote, use the pinchings. I found that funny, but I know what they mean. Basil is so good that it is a shame to throw away the pinchings. Today I cut back my basil plants (I have three). They are blooming and it is past time to make Pesto. I cut most of the plant off, but on each plant, I left one or two blooming branches. The stubs of the cut branches should sprout new growth. After cutting the branches, I shook each one in an effort to rid the plant of bugs. Inside the house, I had a sink full of cold water ready for the branches. Before putting them in the cold water, I rinsed each branch thoroughly with hot tap water. Bugs are more likely to let go when sprayed with hot water. After spraying the branch, I put it in the cold water. When I was finished, I placed a heavy plate over the plants in the cold water to make them stay under the water. After around 10-15 minutes, I removed the plate. I removed each branch, one at a time, first shaking it under the water and then rinsing it under fresh cold water, making sure that I sprayed all of the leaf surfaces. I laid the branches in a large strainer to drain. 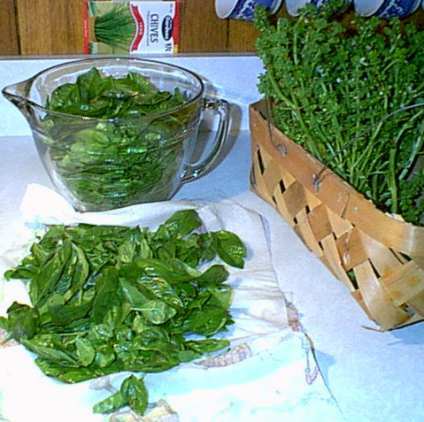 Image shows cleaned basil and the basket of stripped stems. The stripped stems were returned to the garden. After that, it was simply a matter of plucking off the leaves without getting any branches. I placed the leaves on paper towels and patted them dry. I measured them by placing them in a large measuring cup, just shaking them down a bit, not packing nor allowing them to be too fluffy. I had 10 cups of leaves. Once I knew how many cups of leaves that I had, I made pesto and packed it in pint bags for the freezer. I could write more about basil, how wonderful it smells and tastes, its long regal history, what its name means, other uses for basil other than pesto, but it is time to cook the evening meal. See you around! Two new color wheels! A printable file named Boxes! Go and compare colors with these printable files now! or soon.